Yet many of our city’s churches face an uncertain future. We built churches for a much larger city than the one we now have, and in the wake of depopulation are left behind buildings whose original purpose is far gone. 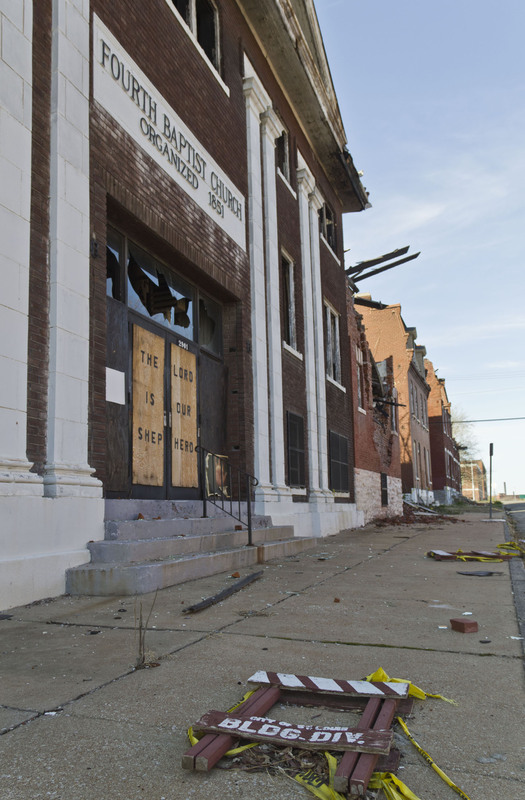 In north St. Louis, some historic churches sit in neighborhoods whose built environments have been ravaged by neglect. These churches stand as potential anchors for transformation, but face uncertain demand for reuse. Some creative re-purposing has taken place, but many of these buildings sit empty or in disrepair. Some are for sale, waiting on buyers with imagination. 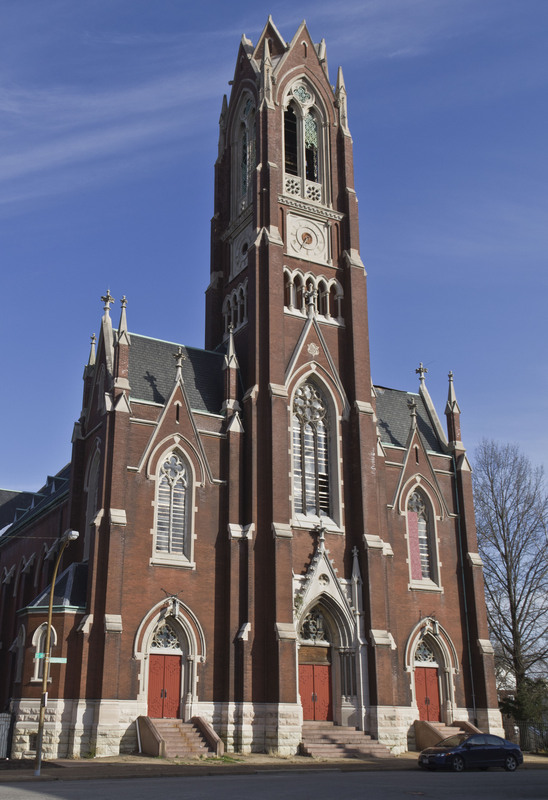 Some are used or owned by congregations that cannot afford the building upkeep — and are not eligible for historic rehabilitation tax credits that otherwise would offer financial solutions. Others are vacant and abandoned, close to being lost forever. No matter what the situation, these buildings are large and delicate, requiring extraordinary rehabilitation efforts that can be very expensive. We offer this page to draw attention to church buildings in need of some form of assistance in order to survive. For-sale opportunities are noted. Let us find stewards who can preserve these remarkable architectural works amid ongoing north side neighborhood renewal. 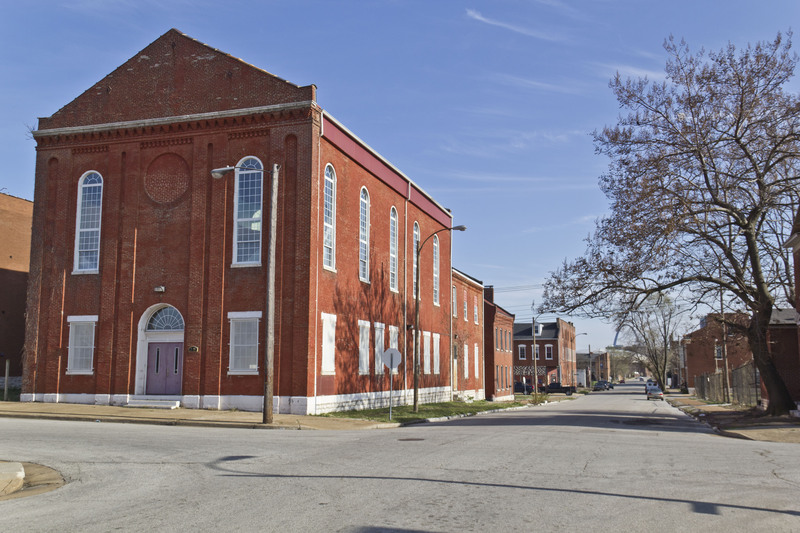 Also, if we should include a church building in your neighborhood on this page, contact us at contact@preservationreseach.com. St. Liborius, 1978. Photo: Landmarks Association, Janice Broderick. The Archidocese suppressed St. Liborious parish in October 1991. Following the closure of the building, most of the interior furnishings were sold at auction. The Archdiocese leased the parish property to the Catholic Workers, who operate Karen House in the adjacent parish hall. The main church building is used for storage by a sculptor but needs extensive repairs. Many of the windows are broken, including those in the tower. 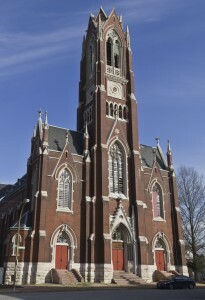 The parish buildings are listed in the National Register of Historic Places; read the nomination here. 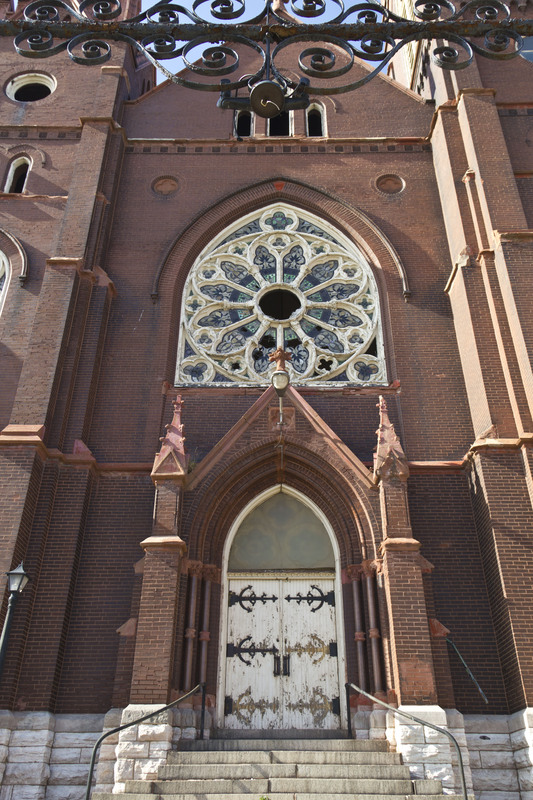 Located on the only block of Lismore Street in the city, St. Augustine’s is a Gothic Revival brick church adorned with stone and stained glass windows designed by Emil Frei Art Glass of St. Louis. The sanctuary contains original oak pews.The church is joined to a 1928 Tudor Gothic rectory via a passageway. The rectory designed by W. Diemert & Son is built of yellow brick upon a limestone foundation. The St. Augustine’s parish buildings were listed in the National Register of Historic Places in 1982; read the nomination here. Currently, the Last Awakening Christian Outreach Center owns the parish buildings. The worship space is a room built inside of the sanctuary by an earlier owner. Last Awakening would like to raise money to repair the sanctuary and restore its stained glass windows. Bethlehem Lutheran Church in 1993. 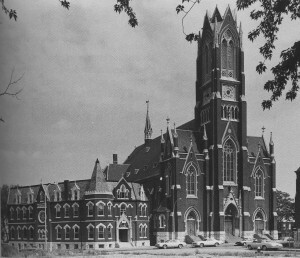 Photograph from the collection of Landmarks Association of St. Louis. Architect: Louis WessbecherBethlehem Lutheran Church originated in a building at 19th and Salisbury streets to the east. 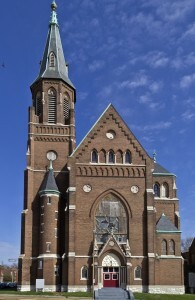 The new church completed in 1895 was a soaring brick building showing a strong German Gothic influence. The nearly-symmetrical front elevation is buttressed by two towers of different types. Red sandstone and terra cotta accents the brick building. Large lancet-arched windows retain stained glass windows and tracery, although many of these windows are severely damaged and unboarded. The interior has a center-aisle plan as well as balcony seating. Currently, the church building sits vacant but not for sale. The Bethlehem Lutheran Church congregation survives and meets next door in the church school building, but has no plan for the abandoned sanctuary. 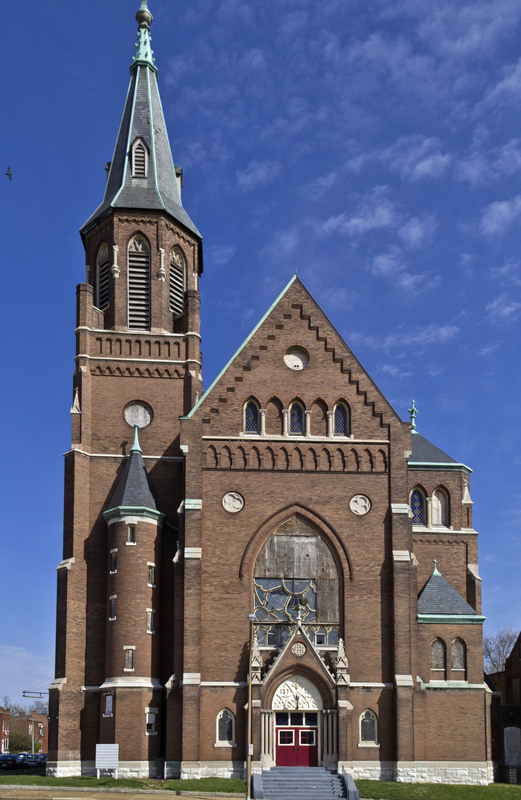 Listed as a St. Louis City Landmark in 1976, the Bethlehem Lutheran Church has found its place on Landmarks Association’s Most Endangered list in 2006, 2007, 2008 and 2011. with missing guttering and open windows, the building is besieged by water infiltration causing slow but steady deterioration. 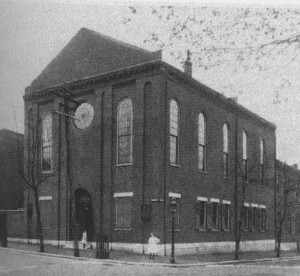 Fourth Baptist Church has existed in Old North since 1851, and built the oldest building on the site at 13th and Sullivan avenues in 1879. The sanctuary, completed in 1924 in a modern interpretation of the Greek Revival style, is one of the starkest and most urban churches in north city. The dark machine-raked brick walls are placed right at the sidewalk line, with simple white terra cotta pilasters and spandrels providing ornament. The sanctuary is joined to a historic house on Sullivan Avenue (dating to 1869) and the original church building (expanded with a new front elevation and second story in 1906). The context on Sullivan Avenue is largely intact. Fourth Baptist is right at a northeast bend in 13th Street, making it highly visible from far south on 13th Street. On September 20, 2008, a fire started in the vacant Fourth Baptist church. The complex had been vacant since 2002 when the congregation decided to move out after the boiler broke. The cause of the fire is still unknown. The fire led to the collapse of part of the original church building and heavy damage to the roof and interior of the sanctuary. The masonry walls and some steel structural members remain intact, making the shell structurally sound. 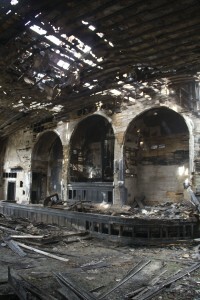 Meanwhile, the interior still holds the hymnals and the scorched pews. The future for the church building is unknown. Zion Evangelical Lutheran, c.1890. Private collection. 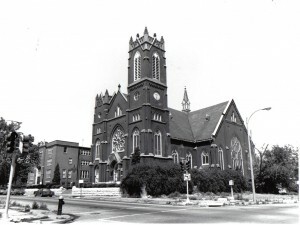 German-American Lutherans founded Zion Lutheran Church on the near north side. In 1860, the congregation completed this two-story red brick building at the corner of Warren and Blair. 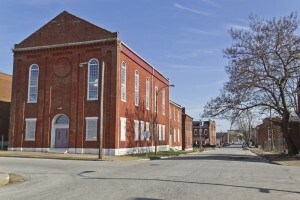 The Zion church building is the oldest remaining Lutheran church in St. Louis. The Classical Revival building shows the expressive properties of brick through pilasters, corbelling and other patternwork. The sanctuary was placed on the upper level, with tall round-arch windows providing daylight, with a social hall and Sunday School below. Carpenter Henry Brueggemann, member of the church, oversaw all construction. He was assisted by other church members which happened to include a brick maker, a lumber dealer, and a fellow carpenter. In 1895, the congregation completed a massive stone church at Benton and 21st streets to the west. Other congregations used the building until around 2007, when it went empty. The church building is a contributing building to the Murphy-Blair Historic District. 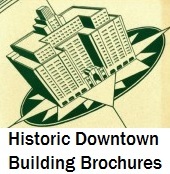 At present, the building is for sale; more information is online here. This page was created and written by Preservation Research Office Director Michael R. Allen and Intern Michaela Burwell-Taylor.